Hey, I was looking around online trying to find a way to catch up on new episodes of Dragon Ball Super. I hate going on sketchy websites that slow my computer down just to watch a single episode. Thankfully I stumbled on Crunchyroll. Crunchyroll is a site that features thousands of different shows and manga. It features big name shows like Naruto Shippuden, Dragon Ball Super, Bleach, Attack on Titan, and One Piece. Also, it features tons of anime shows I've never even heard of. 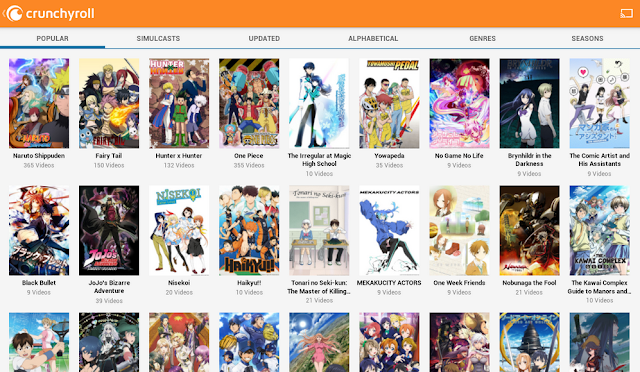 Crunchyroll has an easy to navigate website and did I mention it is free. Crunchyroll is available for both IOS and Andriod devices. I would recommend this to anyone who is a fan of anime or anyone just looking for new cool shows to watch. Now I'm gonna go check out some new shows, and some older ones I never got a chance to watch.